We all love a fresh pot of coffee, brewed early in the morning, maybe as the sun rises. If you’re up that early, maybe writing the draft of that novel you’ve been dreaming of, then a warm cup of coffee is going to be a must. What about throughout the day. That pot of coffee might cool down and start to be less drinkable. Since no-one really wants to microwave their coffee cup every time, it’s nice to have a thermal carafe that will keep your cup of joe warm all day. This is especially helpful when you find yourself coming back to the coffee maker, again and again. Maybe one last time after that. While the glass pot is a classic aesthetic feature of the coffee machine, used for ages, it’s not exactly the most efficient element to keep coffee warm. Classic and Rich Brews: Our Classic Brew delivers smooth rich, balanced flavor from your favorite coffee. Want to take it up a notch? Rich Brew is richer than Classic for a more intense flavor that really stands up to extra milk and flavorings. Over Ice Brew: Over Ice Brew dials up the richness even further by increasing the coffee concentration to compensate for melting ice, so it won’t taste watered down. Refreshing, huh? Specialty Brew: Specialty Brew creates our highest concentration of coffee. It’s a coffee extract that, like espresso, you can use to create coffeehouse-style hot and cold layered beverages—right in your own home. You’ll impress even yourself! One unique feature that makes this a great purchase is the ability to dial in a half or full carafe. This is a big deal if you don’t like sticking to the Keurig single cup system or don’t want to brew an entire pot of coffee either. 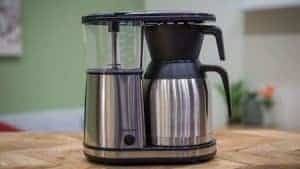 It also makes a coffee concentrate, that is not espresso, but some might find this to be a good solution to buying a whole other system to produce solely espresso. Granted this is a more expensive unit than most standard coffee makers, this is because of the advanced features and the thermal carafe. However, it’s also one that takes up a lot of counter space. 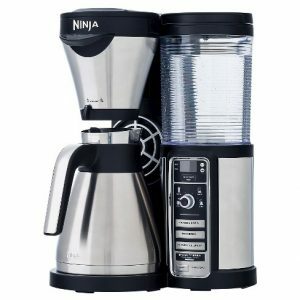 The buyer that chooses the Ninja Coffee Bar knows exactly what they want in their coffee maker, and they are better because of it! The Cuisinart has some impressive features of its own. If you live in a family that’s split by the love of tea and coffee then this will be a perfect appliance for you. The Cuisinart CHW-14 is a great way to compromise. It brews a full carafe of coffee but also has a separate dispenser for just hot water. The 56oz reservoir keeps approximately 13oz of water hot at all times for those opting for tea instead. The Cuisinart CHW-14 programmable thermal carafe coffee maker is perfect for people on the go. Prepare the machine and set the timer the night before and hot coffee will be waiting for you when you awake the next morning. Hot water is easily dispensed for tea, hot cereal, or hot chocolate. 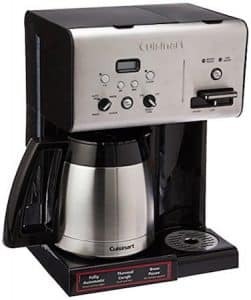 The Cuisinart’s dependability and style throughout, this stylish coffee maker offers a lot of flexibility and quality. More than just a programmable coffee maker, the Cuisinart CHW-14 is actually two appliances in one. On the left is the Programmable coffee maker. The right side of the Cuisinart CHW-14 machine is a hot water dispenser. No need for a separate kettle when one person desires coffee and another needs hot water for something else. A built-in charcoal water filter makes sure that your water is perfect for brewing from the coffee maker’s reservoir. This is enhanced by the permanent gold-tone filter, which helps you get more out of the coffee without the possibility of the flavor of a paper filter coming through. This brewer also takes the quantity of coffee you want to make into account. You can select between one and four cups per session if you so choose. It will also give you a notice when cleaning is needed. Which is a great way to keep your peace of mind when investing in such a complex and relied upon piece of equipment. This is quite a beautiful looking brewer. It’s got the right look if you’re working in a controlled laboratory and need a fitting coffee make, not only for aesthetic purposes but also for functionality. 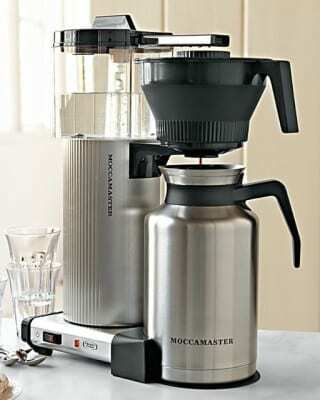 If you were to take the average run-of-the-mill coffee maker and then add all the bells and whistles you could imagine, then you’d find yourself with the MoccaMaster. This stunning brewer is all you could ask for. 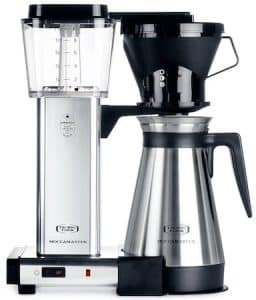 Made in the Netherlands, the Technovorm Moccamaster KBTS model features a thermal carafe and a manual-adjust, drip-stop brew-basket which provides adjustability for a full carafe or half carafe. The KBTS brews a full 32oz pot of coffee in six minutes. The thermal carafe will keep your coffee hot up to an hour however, Consumer Reports has tested the carafe to stay hot for up to six hours. That’s pretty impressive and truly shows just how functional this brewer can be. First, there’s an updated shower head allows for optimal coffee saturation, leaving no coffee ground untouched. The U-shaped Filter Basket additionally works the coffee ergonomically, this helps tamp the grounds down so that nothing sneaks over the filter basket and into your coffee. Next, we’ve got a unique pre-infusion mode. This allows your grounds time to bloom and reach their full flavor potential. This well-crafted brewer is certified by the Specialty Coffee Association of America meaning it has been scrutinized by some of the finest coffee experts around. And of course, we should mention the honorably designed stainless steel carafe. 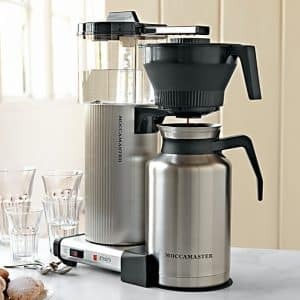 The hefty 8-cup thermal carafe will keep your coffee toasty for about an hour when using the included pour-through lid. Science is the first guilty culprit when it comes to a sentencing of perfect coffee. If one could simply impart some of the best technology around into their coffee brewer, then the theory is that great coffee is on the way. Microprocessor-controlled brew cycle replicates the pour-over method to produce 2-9 cups of SCAA-certified perfect coffee. Water is heated and held at the perfect temperature for coffee. Rainmaker shower head evenly disperses water over coffee grounds for uniform saturation and full flavor extraction. The intuitive LED interface features a backlit screen that displays the Coffee Maker status and the freshness indicator. It’s easy to program and the one knob alarm makes waking up with fresh, already-made coffee a no-brainer. The OXO On Barista Brain Brewers performance is observed in the ability to reach 195° to 205° F for five or six minutes. This is the industry standard for optimal brewing and an indication of the coffee’s final concentration. This aids to the end product which is a perfect cup of coffee. Though it’s more expensive than some of the higher-end drip machines, you get plenty of hot beverage-related utility for that added cost. The design is of course very unique and adds a certain flair to the countertop. 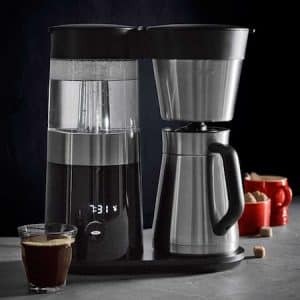 All of these brewers feature the sleek thermal carafe as a part of their setup, however, we hope that the features surrounding them will help you identify the perfect drip coffee maker for you. Of course, there’s just too much coffee gear out there to have at home, but you can always read our reviews to get the real scoop on such wonderful coffee making wares.